Thaís Queiroz Morcatty’s fascination with nature began when she was a child. Growing up in the city of Belo Horizonte in Brazil, she spent long hours observing and reading about nature, science, and wildlife. 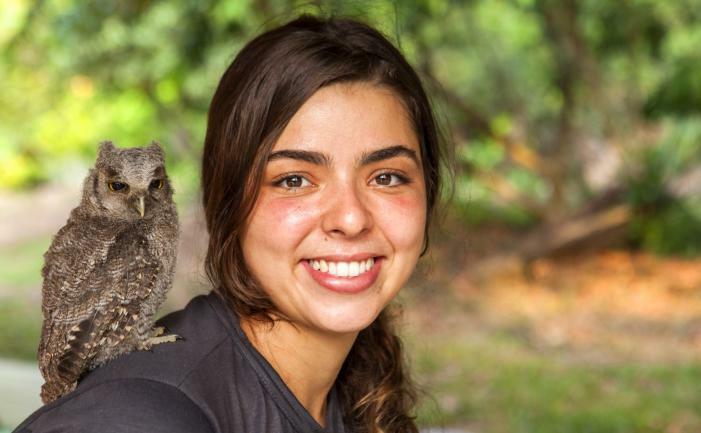 Early on in her academic career, Thaís volunteered and interned for various conservation projects inside and outside the university. Her experiences in the field provided her with first hand knowledge of the negative impacts caused by human activities, both on our planet and the environment, and on wildlife. This only solidified her decision to pursue a career in conservation and dedicate her life to mitigating human impacts on wildlife. Her work eventually led to a project for community-based monitoring of marine turtles, seeking alternatives for decreasing impacts on fisheries of these species. During the past four years working in the Amazon, Thaís has studied the cultural aspects of local hunters and the ecology of game species, and performed environmental education for the conservation of threatened species through jaguar and chelonian monitoring programs. Her biggest concern is for felids (wild cats) and chelonians (turtles, tortoises, or terrapins), species that are among the most threatened in the world. She also hopes to tackle one of the main threats to these species in Brazil, the illegal wildlife trade. Thaís aspires to conclude her PhD and become an expert researcher on wildlife trafficking. By focusing on felids and chelonians as a flagship species, she believes she can combat the illegal traffic of all wild species and have an influence at the national policy level. She hopes to build a network of people from many sectors and on the ground to sustainably manage local use of natural resources and protect them from traffickers. She also wants to develop projects with local stakeholders involved in the illegal wildlife market chain, especially hunters from rural communities, traders, and consumers. By understanding the motivations of every interested party, Thaís hopes to increase their awareness of the socio-ecological impacts of the trade and create alternative sources of income for the community. Learn about the WCN Scholarship Program here. Thaís Queiroz Morcatty's fascination with nature began when she was a child. Growing up in the city of Belo Horizonte in Brazil, she spent long hours observing and reading about nature, science, and wildlife.